Bush honeysuckle can grow very big, these are growing along my road inside city limits. If I could drive down my lane with my eyes closed, I would. As much as I love anything green and growing, I have a hard time looking at all of the invasive Bush honeysuckle currently in full bloom. It’s the proverbial dilemma of beauty versus damage to native natural communities. A friend of mine has carefully pruned Bush Honeysuckle shrubs all around her property, only to wonder now why nothing is growing under them but she won’t believe it’s the lovely bush honeysuckle. The bush honeysuckle flowers look similar to the native fragrant honeysuckle vines. Bush honeysuckle produces a chemical that inhibits everything that grows under and within close proximity to its roots. 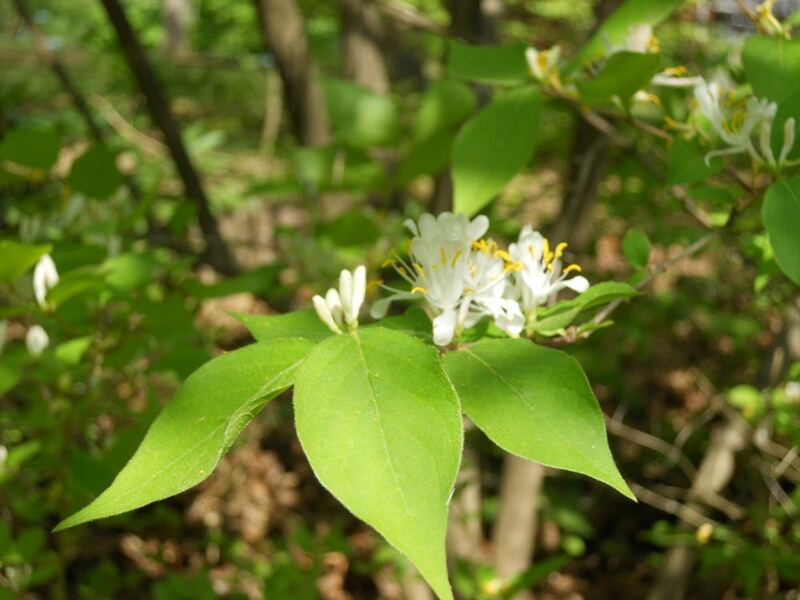 A native of Asia, Bush honeysuckle produces leaves earlier in the spring and holds on to them late in autumn, giving it a decided competitive advantage over many native plants. In addition, the Bush Honeysuckle entices birds with their bright red berries, ensuring that their seeds are widely scattered even though the berries themselves don’t offer birds much in terms of food value. 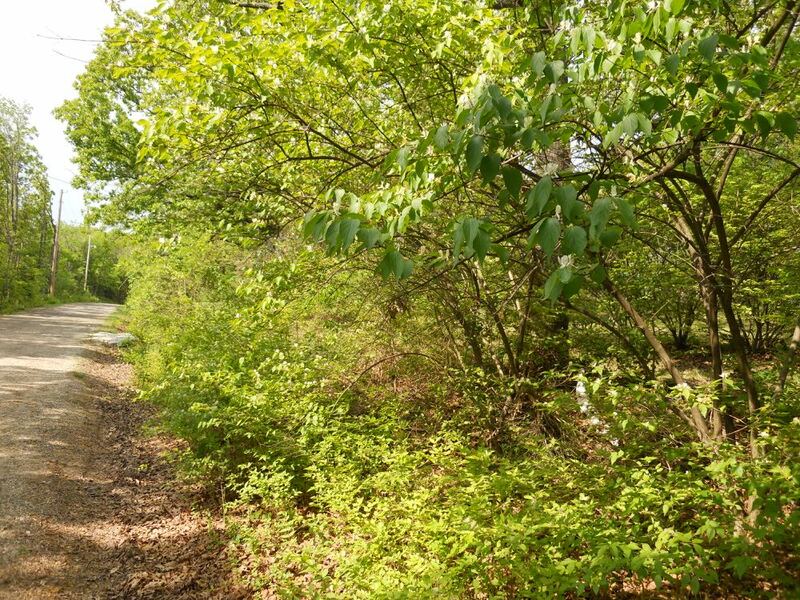 Some communities now sponsor Bush honeysuckle removal days, mobilizing volunteers to yank, pull, cut – whatever it takes – to remove the plants. You can easily pull young bush honeysuckle out of the ground after a good rain. I started my own battle against Bush honeysuckle several years ago when a former office colleague came over early spring and helped me cut down the largest bushes. As he cut the larger branches I yanked at the 1-3 year starts, quickly creating a huge pile of greenery that overwhelmed my three empty composters. I continue the battle, waiting for days after a good rain to walk through my hillside garden and yank at all of the plant starts I can find. This pile of bush honeysuckle were yanked out of the ground and are now in the compost pile. For those plants that have tried to escape my attention, red yarn decorates their trunks so that they are targeted for removal once my handyman brings his chain saw over for a day. I have my own chainsaw but my brother David made it clear I was not to use it on my own. It’s good advice, I’ve been known to unbeknownst to myself at the time stab myself with a trowel. Or a bread knife. Missouri Department of Conservation suggests the best time to tackle these plants is fall, after leaves fall, when their sap is receding and one can apply any one of those site-specific weed killers. Since I have honeybees, I don’t use those products on my property, relegating me to the ongoing battle of pulling the plants as often as I can and denying them an opportunity to produce berries. These plants grow almost everywhere: lake and stream banks, marshes, fens, sedge meadows, wet and dry prairies, savannas, floodplain and upland forests and woodlands. A recently introduced pest, the European Honeysuckle aphid, somewhat controls flower and fruit production in some of the bush honeysuckles. Heavy bug infestations cause tips of branches to form "witches' brooms" or deformed twigs, often greatly reducing fruit production. Native ladybug beetles, however, have been noted to control the aphids. Guess this will continue to be my battle as long as I don’t drive myself off the road!